Background: Engaging residents in patient safety and quality improvement initiatives is sometimes difficult. The primary goal of the current study was to develop a standardized learning experience designed to facilitate patient safety discussions during rounds. Methods: Residents who were on inpatient rotations during a 2-month period in 2014 were exposed to patient safety discussions on rounds. Residents who were not on inpatient rotations served as a control group. Faculty received weekly text reminders with 3 questions designed to engage residents in patient safety discussions. Before and after the intervention, residents were asked to complete a modified Agency for Healthcare Research and Quality Hospital Survey on Patient Safety Culture. Faculty members were asked to complete a brief survey designed by the study investigators. Results: Of the 160 residents who participated in the study, 49 responded to both the preintervention and postintervention surveys (31%). 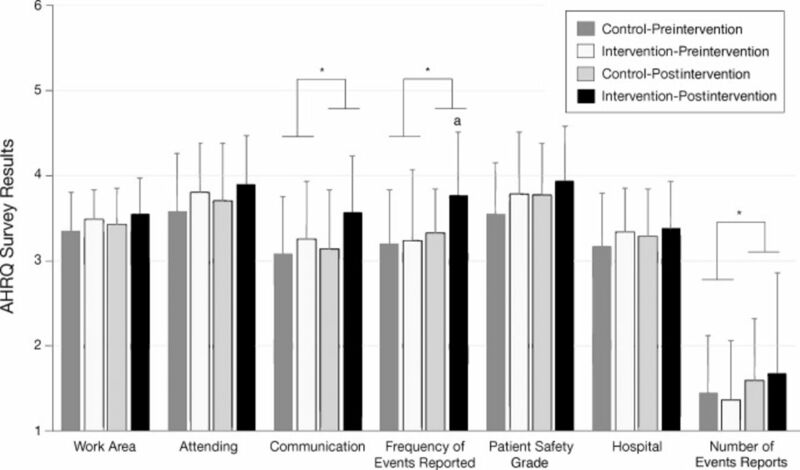 Residents who participated in patient safety discussions during rounds reported higher frequencies of safety events reported compared to the control group (P<0.05). Both groups of residents reported better communication (P<0.01) and an increased number of safety events reported (P<0.01) at the end of the intervention. Twenty-two faculty were surveyed, and 19 responded (86%). Most faculty felt incorporating patient safety discussions on rounds was constructive and that the residents were responsive. Few faculty members felt the patient safety discussions were burdensome. Conclusion: Using weekly text reminders with 3 prompts to incorporate patient safety discussions into rounds was well received by faculty and residents and had an impact on communication and error reporting. Improved patient safety and quality of care have been healthcare priorities since the publication of To Err is Human.1 These goals are also reflected in resident education and training. Not only does the Accreditation Council for Graduate Medical Education Next Accreditation System include quality improvement milestones, but Clinical Learning Environment Review programs have been established to ensure residents are integrated into institutions' patient safety and quality improvement programs. Consequently, academic medical centers are incentivized and held accountable for resident participation in the hospital's patient safety and quality improvement initiatives. Our Lady of the Lake Regional Medical Center is a primary site for residency programs with varying degrees of patient safety curricula. The primary goal of the current study was to develop a standardized learning experience designed to facilitate patient safety discussions during rounds. The standardized learning experience included text messages with 3 questions designed to encourage discussion about identifying safety events and reporting these events. We hypothesized that incorporating weekly patient safety discussions into the team's workflow would improve communication regarding patient safety and increase safety event reporting at the hospital. In 2014, participants were recruited from 5 residency programs (emergency medicine, internal medicine, psychiatry, surgery, and pediatrics; n=160) located at Our Lady of the Lake Regional Medical Center in the southern United States. The intervention took place between March and May 2014. During this phase, residents on inpatient rotations and residents rotating in the emergency department participated in the standardized learning experience (intervention group). Residents rotating on outpatient rotations and residents rotating at other emergency departments served as a control group. Residents were surveyed prior to and after the standardized learning experience. We recruited faculty members in each of the 5 residency programs to participate in the intervention. Faculty members (n=22) were surveyed after the intervention. Faculty members surveyed conducted patient safety discussions as part of the intervention, but they were not part of the study team. This study was approved by the institutional review boards at Louisiana State University Health Sciences Center-New Orleans and Our Lady of the Lake College. The investigators made minor modifications to the modified Agency for Healthcare Research and Quality (AHRQ) Hospital Survey on Patient Safety Culture.2 Adjustments included changing “these hospitals” to “this hospital” and “supervision/manager” to “supervisor/attending.” The AHRQ survey is comprised of 9 sections: Your Work Area/Unit (19 questions), Your Supervisor/Manager (4 questions), Communications (6 questions), Frequency of Events Reported (3 questions), Patient Safety Grade (1 question), Your Hospital (11 questions), Number of Events Reported (1 question), and Patient Safety Needs Assessment (residents are asked to select 5 topics from a list of 11 items). Demographic information is obtained at the end of the survey. Responses to most questions on the modified AHRQ survey are rated on a 5-point Likert-type scale, with response options from 1-strongly disagree to 5-strongly agree. Response options for items that measure frequency are from 1-never to 5-always. The Patient Safety Grade question has 5 response choices, ranging from excellent to failing. The Number of Events Reported question has 6 response choices: none, 1-2, 3-5, 6-10, 11-20, and 21 or more. Residents were asked to complete a baseline modified AHRQ survey prior to the intervention and to complete the modified AHRQ survey again once the study had concluded. Please remember to ask the following questions during hospital rounds today: (1) “Did anything happen today that resulted in harm or could have resulted in harm to your patient?” (2) “Was this a system error, a process error, or a human error?” (3) “Is this a solvable challenge, and if so, what are the appropriate reporting mechanisms?” Also, please remember to reply by end of day indicating that a safety round discussion took place. If possible, feel free to report back the topics and answers discussed. Do NOT include any identifying resident or patient information in your reports. Throughout the intervention, faculty reported to the study team whether they held patient safety rounds that week. When near misses or adverse events were identified through these discussions, faculty members reported them to the study team. The study team then submitted the information to appropriate hospital personnel. Once issues were addressed, faculty were informed of the solutions or decisions that were made, closing the feedback loop. Faculty who participated in the intervention were asked to complete a 10-question survey about their experience at the end of the intervention. One question queried demographic information about the residency program to which the faculty member belonged. Five questions about the patient safety discussions were rated on a 3-point Likert scale. Three open-ended questions asked for feedback about outcomes and how to improve patient safety discussions. The final question queried whether faculty intended to continue using patient safety discussions on rounds. Because of the large number of analyses that would have been required to examine each item of the modified AHRQ survey, we averaged the items for each section and examined the mean section score. We did not include Section H (Patient Safety Needs Assessment) in our analyses at this time. To determine whether the intervention affected residents' opinions of patient safety at the hospital, we used repeated measures analysis of variance (ANOVA) to compare groups (intervention vs control) and preintervention vs postintervention survey results for each section. Statistical significance was set at P<0.05. Information obtained from the faculty survey was examined qualitatively. Overall, 49 (31%) residents completed both the preintervention and postintervention survey. Of these, 27 residents were exposed to patient safety discussions (intervention group), and 22 residents were controls. Overall, both groups reported better communication on the postintervention survey compared to the preintervention survey (P<0.01), and there was a trend toward improved ratings on the communication section of the modified AHRQ survey for the intervention group compared to the control group (P=0.07). Residents in both groups reported increased frequency of safety event reporting on the postintervention survey (P<0.01), with residents in the intervention group reporting higher frequencies of event reporting compared to the control group (P<0.05). Residents in both groups reported an increase in the number of safety events reports on the postintervention survey (P<0.01). We saw no preintervention to postintervention survey changes in opinions of the work area, hospital, supervisor/attending, or patient safety grade sections of the modified AHRQ survey (Figure). Resident responses to the modified Agency for Healthcare Research and Quality (AHRQ) survey administered before and after the intervention. Values on the y-axis range from 1-6, reflecting the responses to questions on the AHRQ survey that were rated on 5- or 6-point Likert scale. Higher ratings reflect more favorable responses. *Both the intervention and control groups' ratings changed from the preintervention to the postintervention survey, P<0.01. aThe intervention group changed significantly more than the control group from the preintervention to the postintervention survey. Nineteen of the 22 faculty members surveyed (86%) completed the faculty survey. Their responses to the multiple-choice questions on the survey are presented in the Table. On the open-ended questions, faculty reported a perceived need for more support, including (1) integration of safety discussions within the physician notes of our electronic medical records; (2) suggested patient safety topics; and (3) better communication with the quality team to see the impact of reporting. Overall, 95% reported that they are continuing to incorporate patient safety discussions into rounds. Overall, residents in both groups reported improved communication on the postintervention survey, with a trend towards residents in the intervention group reporting better communication than the control group. While residents in both groups reported increased frequencies of reporting, residents in the intervention group reported higher frequencies in reporting safety events compared to controls on the postintervention survey. On the postintervention survey, both groups of residents reported an increase in the number of safety events they reported. The patient safety discussions during rounds were well received by faculty members. The medical profession has focused on individual responsibility for medical errors, precluding opportunities to examine problems and learn from a systems-based perspective.3 This study asked physician teams to incorporate 3 questions designed to give them a framework for talking about safety events into their rounds. They were asked to discuss whether anything that happened may have resulted in harm to a patient and what the classification of the error would be, as well as to identify the appropriate reporting mechanism. The goal was to create dialog between faculty and residents when rounding with their patients. We hoped to provide a structure that would allow them to think deeply about potential problems and solutions to these problems, creating a personal engagement in patient safety and quality assurance. Residents in both the control and intervention groups reported increased communication and increased number of events reported on the postintervention survey. Faculty work in a variety of settings with residents, and receiving weekly text messages in one setting appears to have generalized to other settings and increased patient safety discussions in those other settings as well. Most faculty members reported they continued to incorporate safety discussions in rounds after the intervention period, signifying some success in creating a sustainable framework for discussing patient safety during rounds. Medical error reporting is instrumental in allowing hospitals to identify and address both systematic and human errors to improve patient safety. Despite the critical role that error reporting plays in addressing patient safety issues within hospitals, physicians have been reluctant to engage in reporting.3 Barriers to physician reporting include intrapersonal factors, medico-legal issues, and the healthcare environment.4 In the current study, we noted that most faculty members chose to report safety events to the study team via text message. In addition, the faculty continued to rely on the study team to forward information about safety events to the appropriate channels. Despite increased recognition of patient safety problems, few faculty members chose to report them via the hospital's medical error reporting system. One limitation of the current study is that only 31% of residents' preintervention surveys could be linked to their postintervention surveys, so there may be bias among residents who chose not to respond. This study did not have adequate power to examine each item of the modified AHRQ, so we averaged items across domains. A larger sample size would have allowed us to investigate more nuanced perceptions of residents. In addition, we were unable to collect hospital data on the number of events reported by residents. Therefore, these data are based solely on residents' self-reports. Future work should corroborate residents' self-reports with hospital reporting data. Another limitation is that the data focus only on physicians and residents. We are currently working on a study to promote patient safety discussions during multidisciplinary rounds. Despite these limitations, the current study offers a novel intervention for encouraging faculty members to incorporate patient safety discussion into rounds. Overall, we found that using a weekly text message to remind faculty to incorporate patient safety questions into their rounds was well received by faculty and residents. During the study, residents who participated in the intervention reported increased frequency in event reporting. Faculty members appear to have generalized the intervention to other areas of practice, as the control group also reported increased communication and number of events reported. Future research should continue to explore learning experiences that enhance the culture of patient safety and reporting of medical errors. The authors have no financial or proprietary interest in the subject matter of this article. This work was presented at the Alliance for Independent Academic Medical Centers National Initiative-IV Annual Meeting in New Orleans, LA, in March 2015. Physician event reporting: training the next generation of physicians. : Henriksen K, , Battles JB, , Marks ES, , Lewin DI, Advances in Patient Safety: From Research to Implementation (Volume 4: Programs, Tools, and Products). Rockville, MD: Agency for Healthcare Research and Quality; 2005.